„The year was 2007, and this woman here stepped into a video game development studio in Berlin to boldly go where not that many females she knew (aka zero) had gone before, and to learn all about making these worlds on the other side of the magic mirror. I got out, eventually, but not away. Sarah Steffen grew up between battered sci fi books, her dad’s Atari 520ST (to be replaced by her very own Game Boy the day it came out) and her grandma’s garden in the backwaters near the French border. After some time in London, Cologne, Berlin, New York and the Barrens to study mankind, Media, Philosophy and English she landed in Frankfurt – and won’t leave anytime soon. She has worked as a game producer and project manager in start ups and corporates for more than 12 years, ran her own restaurant in Frankfurt and is currently a freelance agile expert and scrum master, teaching individuals and companies about agile frameworks and mindset. 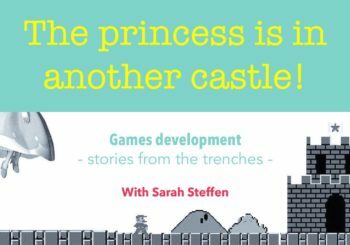 Sarah is also a lecturer for Game Producing at the Games Academy Frankfurt, a mentor with mentorlane.com, a speaker on all things agile, organizing the freelancers&friends community in Frankfurt and currently in the process of founding two start ups. When she’s not working, her and her kids and Emil, the Dalmatian, can be found in the fields and woods around – well, Offenbach am Main. As it is our aim to get more women interested and hopefully excited about tech, we kindly ask male guests to be accompanied by at least two women.